***Disclaimer***: This is for educational purposes only, this is not officially supported by VMware. Use at your own risk. There is also a mention of this in the vSphere 5.1 release notes that VMs running on nested ESXi hosts using VMXNET3 driver could potentially crash. Again, not supported user at your own risk. Next I decided to create a Nested ESXi 5.1 VM, but instead of selecting the e1000 driver which was the only network adapter type that would function for running a nested ESXi host, I choose the VMXNET3 adapter and to my surprise ESXi's networking stack was fully functional. I have not tried any performance tests, so not sure if there are going to be any significant benefits but pretty cool nonetheless! Have you experienced the second nic on a nested ESXi5.1 having no networking connectivity? In my lab I was building out nested vSphere, on a vDS I have nic1 on management and nic2 as the vMotion vmk port. For some reason that nic will not have network connectivity. I built an Ubuntu box and put the nics on the same networks and have no issues, it seems only to be ESXi5.1 with the issue. Hello, have you enabled Promiscuous mode on the vDS PortGroup? How did you get the vmxnet3 adapters to show up in the selection menu? First I have created Linux Red Hat 6 64bit with 4 vmxnet3 adapters. Then switched to ESX5 OS in Edit Settings. Converted to Template then deployed VM ESXi from it. 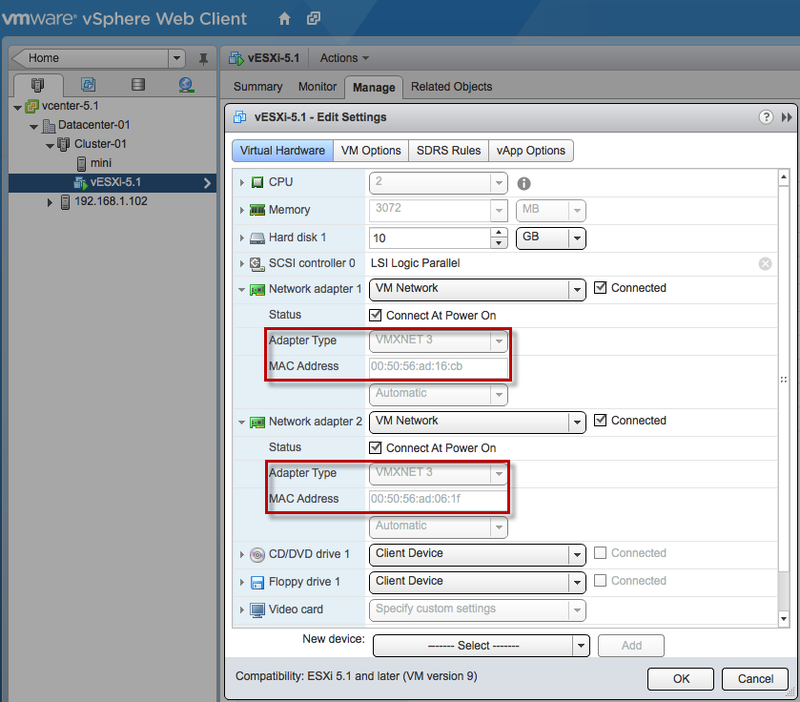 Deployment Wizard showed me that vmxnet3 network devices are not supported for this configuration of nested ESXi VM. Then I started new nested ESXi VM reset ESXi management network of that nested ESXi to regenerate its vmk0 especially because of MAC address conflict with other nested ESXis. Then enabled vmkernel port of it nested ESXi VM for vMotion and PSOD!!!! So looks like you can create and start nested ESXi VM with vmxnet3 network adapter but not working after you modify vmkernel network settings. I had spend all day testing the vESX with all kinds of different configurations. Seems that every time when traffic flows over the VMXNET3 enabled port, ESXi does PSOD. Thanks Will – You helped me fix a problem I was having with nested ESXi dropping packets http://vcdxorbust.com/2013/06/07/how-to-fix-packet-drops-on-nested-esxi/ Much appreciated! HI Guys, If any one of you found a fix for the PSOD issue because of vmnet3, please reply. In my nested ESXi 5.5 environment I noticed an issue. I created my nested ESXi vm using the “Other 64-bit” OS type during creation along with 2 VMXNET3 NICs and then switched it to VMware ESXi 5.x after it was built. I went to add an additional network card and my only selection for the new NIC was was E1000 or E1000e. Changing the OS type back to “Other” allows me to add the VMXNET3 adapter. Not sure if it matters, but I also have the VM Tools fling install in the nested ESXi host. Any insight on this behavior? This unfortunately does not work for me anymore with 5.5u2. I can still set the guesOS to vmkernel5, but then I can only choose e1000 or e1000e as NIC driver. When I try to manually set it in the VMX file I get the message that this OS does not support that type of NIC driver. Well, for nested ESXi the “performance” should be enough. But I would have loved to play with it a little more :). I am trying to create Virtual ESXi on Dell T320 with One vmnic. I am getting “No network Adapter found” error while Powering up the ESXi VM. I have Promiscous mode set to accept. Please help with this issue. Thanks in Advance. Thanks for the reply. I changed Memory from 2GB to 5GB and it worked fine. Did not get the error again. Thanks!!!!! once again for your advise.